Then he looked up at his disciples and said: “Blessed are you who are poor, for yours is the kingdom of God. “Blessed are you who are hungry now, for you will be filled. “Blessed are you who weep now, for you will laugh. “Blessed are you when people hate you, and when they exclude you, revile you, and defame you on account of the Son of Man. Rejoice in that day and leap for joy, for surely your reward is great in heaven; for that is what their ancestors did to the prophets. “But woe to you who are rich, for you have received your consolation. “Woe to you who are full now, for you will be hungry. “Woe to you who are laughing now, for you will mourn and weep. “Woe to you when all speak well of you, for that is what their ancestors did to the false prophets. If I had a pulpit the week where the church read Luke 6:17-26, I would have a few objectives that I hoped to accomplish in preaching to the unlucky group of people who had to endure sitting quietly in front of me for what would, hopefully, take about 15-20 minutes. Objective Number 1: Invite people into my weird, little world. The Bible, like anything else, is heard by your ears and seen by your eyes. It is filtered through your experience, your biases, and your life. You cannot hear the Biblical stories as anyone other than yourself. There’s a tendency, I fear, for modern readers to try to receive the bible “without bias” as if we could remove ourselves from the experience and become impartial observers to some type of “biblical truth”. If you pay attention to the stories, however, you will notice that the biblical writers aren’t impartial, and perhaps more importantly, neither is God. Do we even want an impartial God? Or do we want a God who is for us? How exactly do you become an impartial observer to a story about your own salvation? Or your own condemnation? Our weird, little worlds are the only place, within the individual, in which salvation has any meaning. God is not interested in saving your public face. But, salvation is not an individual work. God redeems the world. God’s plan for salvation is the collective church. We experience it as individuals. The only way for the Bible to make known God’s divine salvation is to discover its individual humanity. We need to know the humanity of Jesus. We need to know the humanity of its authors and its audience. And we need to know yours. Every sermon, every bible study, every interaction at the church should be a window into our weird, little worlds that are seen, and redeemed, and made far weirder by the peculiar behavior of our god. For some people, the reading actual text is a discovery, particularly if you go off the lectionary or choose less common biblical stories and themes. For others, discovery in Luke 6 might be diving deep into form criticism or oral performance and Luke’s literary relationship with Q. When you engage with the Bible with groups, you’re likely going to be engaging both of these people simultaneously. And if you’re really honest, regardless of your biblical expertise, you’re likely both these people at different times. If you were preaching on the Book of Obadiah, or some passage in Numbers, I probably wouldn’t know the text at all. This causes some Christians who engage with others on the Bible to be afraid of getting “too complicated”. I think this fear is unfounded. Just because people aren’t familiar with the text, at a church or bible study anyway, somebody just read the text to them, and as long as they have a phone or a bible in their hands, they can access the text and the footnotes and endless commentaries for themselves. Neither the preacher nor the super special educated Christian is a guardian of secret knowledge, and the people around you are plenty capable of understanding. It’s almost certain that none of us understand it as well or as poorly as we think we do. Instead, the Christian should be engaged in a process of discovering the text, sharing with others what we’ve discovered, and what that means in our weird, little worlds. We should be excited to hear how others are doing that too. Remember what we said about hearing the Bible as an individual, and particularly a certain individual? You know, you? The writer of Luke (who also wrote Acts – see something that might be new!) is also a real, individual person. *** Luke’s intended audience is also a real group of people who Luke likely knows well. But there are problems with this. First off, the author of The Gospel According to Luke is anonymous. Like the other Gospels, the author isn’t named anywhere in the text. The name “Luke” is added to the title later in the 2nd Century. We also don’t really know where the author, who we’re just going to call “Luke” for convenience sake, lives and works. That means that we don’t know with a lot of precision who Luke’s audience is or what their context would be. But due to what we know about the history of Israel in the 1st and 2nd centuries, due to the how that history is presented in the text, and due to the Gospel of Luke’s literary relationship with the other Gospels and the ministry of Paul, the general academic consensus is that Luke is a Gentile writing around 90 BCE to a Gentile audience and that his audience is familiar with and sympathetic towards Judaism. Here’s where it gets weird. Because we don’t know a lot of the details about who Luke is or who his audience is, it’s difficult to figure out exactly what Luke is saying. We are not the audience that Luke has in mind. Luke has an audience. He knows them. The Gospel of Luke is his story, likely presented as an oral speech, to them. We are separated by 1900 years. Luke is writing in Greek. We’re reading translations in English. The original manuscripts of The Gospel of Luke have not been found. We’re reading Greek copies from much later. While a preacher can preach to a congregation with the congregation in mind, and while a person can have a conversation with another person in mind, when we read the Gospel of Luke separated by time, and space, and culture, and language, we’re experiencing a conversation or a speech between speaker and audience of which we aren’t a part. That doesn’t make us the audience of The Gospel of Luke. That makes us eavesdroppers. We are overhearing a conversation. Better yet, we’re overhearing a conversation in another language that is being translated for us. That’s a feeling I know well living overseas. I usually have a good idea what’s going on around me, but I’m never quite sure. It gets weirder. Because Luke isn’t an eyewitness to the ministry of Jesus and is likely a Gentile in another country who speaks Greek, Luke and his audience aren’t the intended audience of Jesus’s speech described in Luke 6. In this speech, Jesus has an audience: the Disciples and the crowds who have come to see Jesus. Luke discovers the speech through a second independent source (see footnotes), and works it into his Gospel. That makes Luke and his audience eavesdroppers on the conversation/speech between Jesus and the Disciples and crowds. Better yet, because Jesus is speaking in the Galilean common language of Aramaic and Luke is writing in Greek, Luke and the early church are overhearing a conversation in another language that is being translated for them. Our relationship with The Gospel of Luke, separated by time and space and language and culture is, in many ways, analogous to Luke’s relationship with the ministry of Jesus separated by time and space and language and culture. Like Luke is to Jesus, we are eavesdropping on the early church and thus should approach these texts with humility. But because we’re doing something similar that Luke and the other Gospel writers are doing, who approached their tasks with an absurd level of prophetic boldness, we should remain humble but never timid. Side note: If you’re a preacher, you don’t necessarily need to connect with your audience. This is a mistake they teach us in preaching class. Your audience knows you better than you know them. It’s simple math. You’re one person and your congregation are many, unless you’re Methodist and there’s like 4 people in the pews. Plus, they listen to you talk for at least an hour every week and you don’t do the same – again, simple math. If you adequately connect the text and context to yourself, they can do the connecting between you and them on their own. Connecting the sermon to you is the top priority. Connecting to your audience is great, but it’s like the Gospel of John on top of Matthew, Mark, and Luke: nice but unnecessary. When I read Luke chapter 6:17-26, I imagine the individual speaking it and the individuals hearing it. I imagine the context in which they are living. And I imagine what it might mean to them. At the same time, I think of my life and my context, my weird, little world of an idealistic failed preacher who moved to Jordan with the naive belief that my wife and I could follow God’s calling in a place filled with the dispossessed. We’re not always doing that very well. When I hear Jesus saying “blessed are the poor”, I hear an actual poor man speaking to other actually poor people. It’s important to remember that neither Jesus nor his Disciples, nor the vast majority of the crowd listening to him, are the absolute poorest people in society. Instead, they’re on the edge. They’ve been pushed there by the rich – the landowners, the state, religious bureaucrats, and Roman clients in Jerusalem and Galilee. They can see over the edge of the cliff. Their way of life is being destroyed by the unstoppable march of Empire. Because of the way the Scriptures are written by the prophets, who regularly spoke to kings and rulers – you know, the people who could read, and because of the way the Scriptures are interpreted, again by interpreters who live in the centers of power, regular people believe that tragedy has struck them because they have been sinful. They believe they deserve it. This is particularly true of those who are desperately poor – those who are orphans or widows or crippled or sick. Covenant language in the Hebrew Bible generally follows a pattern. Scripture sets forth the law. If you follow the law, you will be blessed. If not, wrath of God. This pattern mostly makes sense in the following circumstances: 1) When a prophet is speaking at the temple court to a King or to some powerful royal client, and 2) When the Scriptures are read and proclaimed in a village community operating inside a well-functioning and independent Judah or Israel. These are the situations in which the text was created and developed that I think of as “normative political economy”. But it doesn’t work in an imperial economy, when a king rules over you for the purpose of extracting wealth from your lands. When your land is being taken away by rich landowners empowered by kings and your land raided by armies stealing and burning, the cause of your poverty isn’t breaking normal political/moral/economic relations with your neighbors, the cause is the empire. Blame belongs with them, not you. Jesus does something remarkable here in Luke 6. Instead of the normal pattern of 1) Set forth the law, 2) Declare blessings on those who follow and woes on those who don’t. Jesus does it the other way around. Jesus starts with the blessings. But woe to you who are rich, for you have received your consolation. Woe to you who are full now, for you will be hungry. Then after the blessings and after the woes, he gives the law. When he gives the law, it’s covenantal in nature, meaning, its straight from Exodus and Deuteronomy and Leviticus. He’s renewing the covenant that God makes with Moses and Israel, but only after Jesus blesses the poor and hungry and declares woe on the rich and the full. Jesus is forgiving them so that they can follow the covenant. This isn’t a regular type of speech. It’s a performative speech. It’s like the efficacious signs present in the Sacraments of Baptism and Eucharist. Like the sacraments, Jesus’s speech accomplishes the very thing that it represents or symbolizes. When Jesus says it, it actually is. When he says the poor are blessed, instead of cursed, they are blessed. They are free to follow the covenant when previously they were too poor to follow the laws and traditions of the Judeans. When Jesus says “blessed are the poor” and “woe to the rich” to those very people who are on the brink but not yet desperately poor, Jesus frees them live into the Mosaic covenant which demands they give of what they have, demands they forgive each other’s debts, and demands they liberally lend to those in need. These are the only protections against crushing, desperate poverty that they will ever have. When others act like this, they can afford to do so as well. Jesus speaks with authority. What do we make of this? What do eavesdroppers on the early church make of Jesus’s message to a people on the edge? It’s little wonder that Jesus’s radical message to people who live under the Mosaic Covenant is dulled a bit when overheard by Luke who is a Gentile living over half a century later speaking to an audience of Gentiles. Even still, his message is radical and powerful. It’s little wonder too that the modern church has taken this story and domesticated it further. We have spiritualized it – what Jesus means is the poor are blessed but really only in a symbolic way. We have normalized it – what Jesus means is those who are poor in fill in the blank, not just the obvious-meaning, actual-definition poor. We have broadened it – what Jesus means is that we are all poor sometimes therefore this is a universal, unbiased message from a universal unbiased god. We live under two layers of domestication and the radical speech still shouts from the pages. I ask, do we live under a “normative political economy” or do we live under empire? Most people who read this probably live under the former. But what about the poor? What about the desperately poor, the 10% of the world who live on less than $2 a day? What about my Syrian or Palestinian neighbors? What about the stranger, the alien, and the migrant? With such people do we start off with a word of blessing or woe? With them do we start with law or grace? Do we start with what they need to do or what we need to do for them? The bible outlines both patterns. When do we apply each one? My answer: the poor get the blessings first. The rest of us start with the law. Jesus declared it and made it so in the performative speech of Luke 6. I’ve tried here to welcome you to my weird, little world, where I struggle with the text, the context, what it means for our society, and with myself. I’ve tried to introduce Luke and Jesus and their respective audiences as individual people with real concerns. In doing so, I’ve tried to lay out my thought process of a sermon and have it function as the sermon itself. The goal is to lay out the objectives of a sermon and have describing those objectives function in accomplishing them as if it were performative speech. I don’t know how well I did. I struggle to make my objectives accomplish its conclusions in an article. Jesus did it with one speech flipping the Torah and the Mosaic Covenant on its head with blessings for the poor as the starting point forever. We aren’t Jesus, nor are we Luke, but we can rethink how blessings, woes, and covenant obligations function differently for those of us with power, and those of us without. In your community, are the poor blessed? Are the hungry full? Are the mourners comforted? Are you? ***Well kind of. Luke/Acts was written by one person, but Luke used at least three different sources in writing it. Luke and Matthew often copied from The Gospel of Mark (aka the best gospel) word for word and at other times reworked Mark’s stories for their own purposes. Luke and Matthew also used a second source, called “Q”, which is a series of sayings/speeches that form a cohesive narrative when read as part of Israelite covenantal language in the context of 1st century Roman Palestine. Luke 6 just so happens to be the longest and most important part of these speeches. We call this source, “Q” because German scholars hypothesized its existence and their word for “source” starts with a Q, thus the “Q Source”. Luke also includes some stories unique to Luke’s Gospel, so therefore, we assume, that Luke has a third source to which the other Gospel writers don’t have access. The Gospel of Luke has also been edited in a few places, and, obviously, what you read in English has had a number of different translators. So, while Luke was a real, individual person, the document that you have in your Bible was created by a number of different people. There’s a story about ancient Assyria, when King Ashurbanipal ruled in Ninevah, that gives some clarity to Isaiah chapter 6 from this week’s lectionary text. In 653 BCE, Ashurbanipal invaded the Kingdom of Elam and decimated the country. Overwhelming military victories weren’t enough for the Assyrians, nor was the destruction of Elam’s cities and its people. The Assyrians were terrifying. The consequences of losing to them in battle was well known as scenes such as these were proudly cataloged and displayed by the Assyrian bureaucracy. Their armies were larger. Their soldiers? Better trained. Their technology? Far superior. Their political organization? More efficient. They were the first civilization in history to have a standing professional army and the first to equip their soldiers entirely with iron weapons. They pioneered siege technology, including battering rams and ultimately, siege towers. The cost of inevitably losing to the Assyrians was high. The modern reader has very little context for the horror of this type of overwhelming gratuitous violence. Imagine if ISIS wasn’t just a terror group struggling against weakened Arab states and opposing secular militias. Instead, imagine they were the most powerful empire on Earth, and they regularly invaded other states and decimated their populations. Imagine that other nations were seemingly helpless before their military might, and they had been ruling in this capacity for centuries. Imagine if you were a small kingdom facing up to the reality of an impending invasion by ISIS with no hope of defeating their armies and no hope of saving yourself, your families, or your history – not even the bones of you ancestors would survive. What do you do? Isaiah chapter 6: 1-8 is a well-known biblical story. It’s regularly repeated in churches and Sunday schools. The church sings hymns on Isaiah’s call story, and Isaiah standing before God with angels shielding their eyes from God’s glory is regularly depicted in Christian art. But, we usually stop at verse 8 and ignore verses 9-13. The prophet Isaiah writes the first 12 chapters of the book bearing his name during the Syro-Ephraimite War which started around 736 BCE. The name of the conflict references the alliance between the nations of Syria (Aram) and Ephraim (which I will refer to here as “Kingdom of Israel” or “Israel”) against the Kingdom of Judah. As the Assyrian Empire is rapidly expanding westward towards the Holy Land, the kings of Syria and Israel create an alliance to oppose Assyria and try to force Judah to join. If Judah refuses, these kings will invade Judah and install a new king who will join them in war against Assyria. Upon the death of King Uzziah, mentioned in Isaiah 6:1, Isaiah counsels the new king, Ahaz, not to join the coalition of Syria and Israel against Assyria. He advises the king to wait, to stand firm in faith. He essentially says that in the face of the coming threat to do nothing. He believes that if they wait, Assyria will destroy Israel and Syria and, the threat will pass. Ahaz listens, sort of. He doesn’t join the coalition. Instead, Ahaz joins with Assyria asking the mighty empire for protection from their northern enemies. Assyria invades Syria and Israel who face a predictable end when small kingdoms fight against superpowers. A decade later, Assyria invades Israel once again. Israel’s armies are destroyed. Its cities razed. Its people deported. The Kingdom of Israel and its people become lost to history. And Judah and the House of David, once a proud and independent kingdom, survives, but, they become a vassal to the Assyrian Empire. Their independence comes to an end. Isaiah’s moving call story in chapter 6 verses 1-8 quickly loses its luster for both Isaiah and the reader when God reveals what Isaiah must do now that he’s called. Isaiah will preach and prophesy of complete destruction, “Until cities lie waste without inhabitant, and houses without people, and the land is utterly desolate; until the LORD sends everyone far away, and vast is the emptiness in the midst of the land.” Isaiah’s mission from God is to “make the mind of the people dull” so that “they may not look with their eyes, and listen with their ears, and comprehend with their minds”. Isaiah is to prophesy destruction and, he is to be the vessel that hardens the heart of the people, as if he were Moses before Pharaoh, so that they do not repent nor find God’s salvation. If modern Christians and priests were honest enough to admit it, especially publicly and before their communities of faith, they would admit that we find what God doing through Isaiah in chapter 6 to be both shocking and cruel. If we were honest, which we aren’t, we would label our reactions to God’s here as being one of condemnation of evil. If God is truly hardening the hearts of God’s own people to prevent their own turning away from wrongdoing with the inevitable result being the total destruction of kingdoms, and cities, and lives, with the type of horror that the Assyrian Empire is sure to bring, we must ask ourselves if this is the work of the God who saves, or is this the work of the one who condemns? Is this the work of a God who is good? Or is this the work of the one who is undoubtedly, evil. Just who is calling Isaiah? Christianity faces a crisis with a weary world and with our own adherents over a problem that we do not want to admit or one that we cannot see. It’s not a crisis over whether our God exists. That’s an old crisis. It’s not a crisis over whether our church is effective or good. That’s an even older one. The crisis that we face is whether or not our God, as depicted in Scripture and in history, is worthy of worship. It’s not “Is God dead?” Our crisis is “Is God good?” Can you answer that question with Isaiah chapter 6? As long as you think God brings progress to creation in fulfillment of a better world and as long as you think that history’s arc is long but bends towards justice, I don’t think you can answer that question affirmatively. As long as you think God preserves our people and our church through the practice and protection of our traditions and through the worship and belief shared with our church fathers, I don’t think you can answer that question affirmatively. Isaiah chapter 6, along with numerous texts in both the Hebrew Bible and the New Testament show God breaking the world in often horrifying ways. We can justify the present order only when we ignore what God is doing in the Bible. See for yourself how many preachers this Sunday preach on Isaiah 6: 1-8 and leave out 9-13. I’m sure it will be a moving and reassuring sermon. When God makes the mind of the people dull and stops their ears and shuts their eyes so they cannot see, or hear, or understand, God is doing what God often does to people in positions of power and comfort when God is nudging the world to change. Before God liberates God’s people and creates a new political community through Moses in the Exodus, God hardens the heart of Pharaoh and unleashes destruction throughout the land. Does King Herod find the news of the birth of a new king to be a liberating message? Or, does his heart harden and respond with violence as if he were Pharaoh reborn? Jesus even quotes from Isaiah 6:10 in John 12: 37-43 in response to the people who don’t believe, and particularly to the Pharisees who saw his many signs yet were afraid “they would be put out of the synagogue, for they loved human glory more than the glory that comes from God.” God acts this way in history to end empires and bring about the possibility for human freedom. “The prophet does not scold or reprimand. The prophet brings to public expression the dread of endings, the collapse of our self-madeness, the barriers and pecking orders that secure us at each other’s expense, and the fearful practice of eating off the table of a hungry brother or sister. It is the task of the prophet to invite the king to experience what he must experience, what he most needs to experience and most fears to experience, namely, the end of the royal fantasy is very near. The end of the royal fantasy will permit a glimpse of the true king who is no fantasy, but we cannot see the real king until the fantasy is shown to be a fragile and perishing deception. Precisely in the year of the death of the so-called king does the prophet and the prophet’s company see the real king high and lifted up (Isaiah 6:1). There is no better time for this type of prophesy and no more necessary time for these types of prophets than when you church is facing its end, as mine is doing in the United Methodist Church, and when your country’s historic injustices are made plain for all to see in a domestic political movement that no longer covers biblical injustice up or wishes biblical injustice away, but instead chooses to celebrate them as a defining characteristic. No wonder that the hearts of our political leaders are hard and that we as a political society are incapable of being moved by God. Those of us who dare to open the Bible and live in communities of faith centered around its witness are called, as Isaiah was, to put an end to the powers that co-opt and domesticate our faith. We are called to revive and energize the communities of faith bound to that witness through a prophetic imagination that chooses the future God has promised us over the comforts fiercely and violently defended by the present order. We cannot be made great again. Those who say so are the prophets of a secular faith who place their hope in that which is rather than that which is promised. To these prophets, crisis is akin to a apocalyptic doom with no hope for ourselves or for a world that looks to them for stability, for hope, and for peace. For a people hopelessly attached to a politics and to a church whose old joints groan with any movement, our role is to mourn the passing of church and state with all the appropriate funeral rites so that we can imagine life unbound to its service. I mourn the loss of my church and my denomination. I mourn the loss of the calling to which I was called. I mourn the loss of a body politic who was once, or at least once pretended to be, held together by values of liberty and peace. We don’t need to pretend that losing these things doesn’t hurt or that old wounds don’t sometimes re-open. Isaiah lives to see the destruction of the Kingdom of Israel. He lives to see Judah go to war with Assyria. He lives to see Assyria besieging the city of Jerusalem, only to mysteriously turn back their armies back and go home. He isn’t finished prophesying destruction, nor is he finished criticizing the kings who sit in Jerusalem. The book bearing his name, with a number of different authors, write about future historical crises after his death including the the destruction of the temple, the people of Judah exiled to Babylon, and the end of the House of David. Isaiah is a book that fully practices the task to which we are now called. It mourns what was lost, it condemns the powerful who choose to live by injustice, and it calls upon God to end it. And yet after each crisis, and after each horror of which kings and priests believe is the end of history, Isaiah sets forth a vision of a new world and a promise for new Israel. He never promises that we can be made great again. He promises that God’s future is great, that trusting that future is faith, and our faith requires us to move on. I don’t usually write about theological matters in which I cannot make a clear and not so obvious connection to issues of politics, economics, or social justice, mostly because I feel a bit out of my element, and I’m prone to mistakes easily identified by smarter people. Yet, for as much time as these smarter Christians put into talking about the Trinity, most make clear mistakes. These mistakes distort the church’s image of who God is and what God is doing as proclaimed by Christian scripture and tradition, and it leads to a misunderstanding of Christian life. So here’s my best shot, easily identifiable problems and all. The verdict: most Christians are heretics. I’m not going to attempt to recap the formation of the Trinity because neither you nor I have that kind of time. Instead, I’m going to present what I think most Christians, particularly Protestants, think about the Trinity. Then, I’m going to try to show a better way. Warning: in my attempt to correct what I believe is heresy, I’m probably going to engage in it. At best, I’m walking the line between barely acceptable and blasphemy. That line is where all Christian theology should start. A god incarnated as a poor man from nowhere whose mission is a kingdom over and against the kingdoms of man who is tortured and murdered on a cross – a theology for that god can only exist on such a line. “Acceptable theology” is inherently heretical. Christianity without scandal is not the Gospel. The Traditional Model above describes what most of us were taught about the Trinity and what most of us would say “the Trinity is”. Simply put, one God in three persons, Father, Son, and Holy Spirit. The Father, Son, and Holy Spirit, are of one substance, but the persons of the Trinity are distinct from the other persons. Most Christians simply understand it as “three-in-one, Father, Son, and Holy Spirit”. The details of all of this are lengthy, but it is important to remember that the Trinity is a “negative theology”. Most of Trinitarian theology is a reaction to theological errors, either faulty interpretations of Scripture, or reasoning whose conclusions undermine what Scripture proclaims about God. So to understand it fully is not only an act of a responsible and faithful reading of the Scriptures and the Tradition of the church, but also a study in language, culture, and philosophy of all the various theologians, both orthodox and heretic in the church’s history that has led to the doctrine’s development. Unfortunately, the result of the complexities of Trinitarian theology hasn’t been correct belief as was sought by the original “negative theology” project. Due to its complexity, and church leaderships’ obsession with avoiding error, the response has been non-engagement. Christianity can survive theological error. Christianity cannot survive a church that doesn’t engage. So Christians memorize Trinitarian theology to its simplest level, and leave it alone creating a massive chasm between theologians who imagine what God is like, and the church who attempts to make the prophetic imagination meaningful in lived experience. As a result, most Christians, I believe, make a terrible error in how they understand the Trinity. 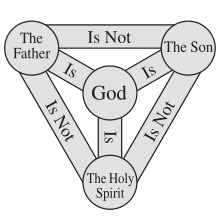 The Traditional Model shown above is an image of the “Immanent Trinity”, or the inner-life of God. It aims to describe the relationship between Father, Son, and Holy Spirit and how all the persons of the Trinity are one God while remaining distinct from the other persons. The problem with Traditional Model and the “Immanent Trinity” is that Scripture doesn’t talk about the inner-life of God very often, and when it does, Scripture is, at best, indirect and vague, leaving us to make numerous assumptions independent of what God has revealed. Worse yet, it assumes that the fullness of God’s nature exists separate from creation. How can a god whose nature is to create, redeem, and sustain exist separate from what was created and have that existence somehow be “full”? By definition, a creator cannot be a creator without creation. A savior cannot be a savior without anything to save. How can created beings say anything of a god who exists “outside of creation”? Any theology of the Trinity that only depicts the inner-life of God is impossible, but separate from what God has done, it also lacks meaning. It fails to answer the question of “so what?” rendering the issue of God’s being pointless to creation (which isn’t a problem if the church’s response is non-engagement). It fails against the basic reality that what we know of God only exists through God’s revelation, and that God reveals through acting in history. Depicting God as anything other than a god who acts in history is to depict a god foreign to the Gospel. Rather than speculate about what God must be like “outside of creation”, and rather than to be so proud to assume that the limited depiction in Scripture of the Immanent Trinity could possibly give us a reliable way to speak about the inner-life of God, and rather than limit God to our own understanding of what is logically necessary as if the bounds of human logic somehow limit God’s nature, Trinitarian theology should rightly point towards what God has done. What God has done and what God is doing in the created world as Father, Son, and Holy Spirit is known as “The Economic Trinity”. Karl Rahner’s axiom, “The Economic Trinity is the Immanent Trinity, and vice versa” addresses this problem succinctly. His axiom in plain-speak means “God really is what God actually does” or “God acting in creation is God in God’s inner-self”. God isn’t just telling us what God is like through God acting in history; these acts are God. The god who creates, redeems, and sustains does not exist outside of history. There is no god “out there”. God is here, or God is nowhere. I believe the consequences of this to be immense. Christians should reject a stale, unchanging model of God who doesn’t feel, act, or change. This means that by acting through love, compassion, and mercy, that God is becoming rather than simply is. God is constant in love and the nature of God remains steadfast, but God isn’t constant in being. By being active in history for us, God is changing God’s being to become more like God’s own nature, by becoming more of a god who creates, redeems, and sustains in history. The traditional understanding of God as unchanging, is inherently contradictory for Christianity and must be abandoned. An unchanging god cannot become human. An unchanging god cannot die on a cross. An unchanging god cannot rise from the dead. A god who doesn’t change, who doesn’t act, who doesn’t feel or think, who doesn’t rejoice, or laugh, or mourn, cannot be fully human. Yet, by doing these things in Jesus Christ, God is no less God. In Jesus Christ, God is not less than, God becomes more of a god for us. The Traditional Model which has described Trinitarian Theology is at best incomplete and at worst detrimental to a Christian understanding of God and God’s history of salvation. It depicts God “outside of creation” to be what God actually is, but the manner in which the persons of the Trinity are “related” has no meaning for how God acts in the world. Furthermore, the model has no meaning for how Christians should treat each other or how we should treat the people with whom we share God’s creation. Against nearly 2000 years of Christian history, I reject the Traditional Model as heresy, and I propose something different. Weinandy believed that his thesis solved a key problem for Trinitarian theology. He argued that this view recognized the proper place for the place of the Holy Spirit rather than relegating the Spirit to secondary status in Christian theology as has been the historical norm. The Spirit, for Weinandy, acts as a sort of “relational person”. The Spirit is what makes the Father, the father of the Son, and it makes the Son, the son of the Father. Without the Spirit, the Father and the Son are not only not Father and Son, but are not one. This process isn’t a linear event in history like the incarnation. This process happens eternally, because begetting and loving is God’s nature. The Son is eternally begotten. The Son eternally loves the Father. The Traditional Model of the Trinity shown originally does two things really well. 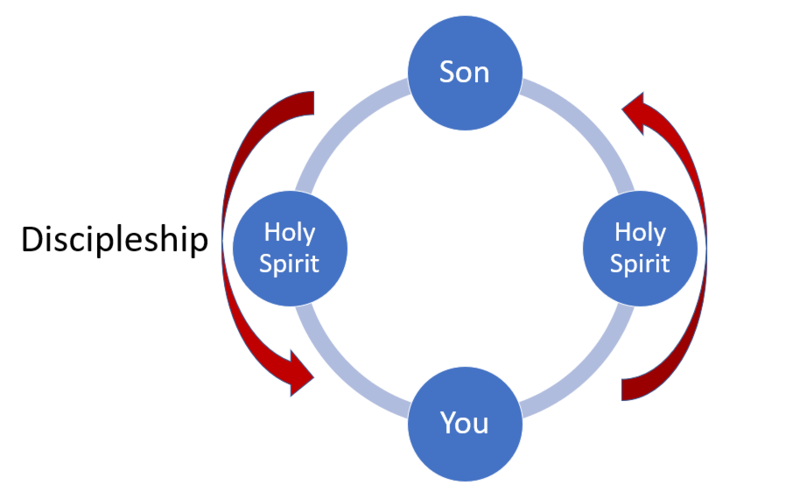 It demonstrates that Father, Son, and Holy Spirit are God and that Father, Son, and Holy Spirit are not each other. However, it is a poor model for depicting anything with regard to Trinitarian theology other than those two statements. If Rahner is right, then the Traditional Model should also be able to show what God is doing in the world in the same manner in which it shows that Father, Son, and Holy Spirit are one with each other in the Immanent Trinity. The Traditional Model cannot do this. The manner in which it holds together the Trinity and shows how the persons of the Trinity are related to each other cannot be duplicated for God’s relationship with humanity or the created world. In this respect, the Traditional Model is a failure. Weinandy’s view solves this problem when expanded, as I have done, beyond the Immanent Trinity. The manner in which the Father is the father of the Son, and that the Son is the son of the Father, and that the Holy Spirit binds you together as disciple of the Son and children to the Father, is the same manner in which the Immanent Trinity is held together as one. 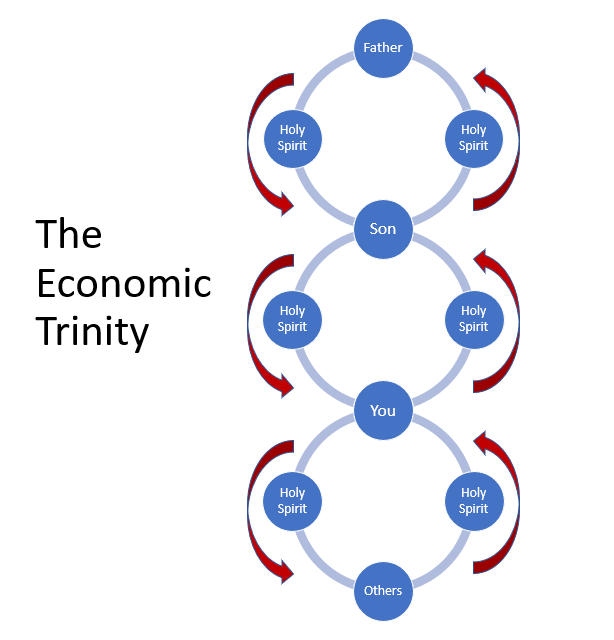 In other words, “The Economic Trinity is the Immanent Trinity and vice versa”. What God is doing in God’s relationship to you is what God is doing in God’s inner-life. As the Father begets and sends the Son in the Spirit, so too are we made in the image of Christ and sent by Christ in the Spirit into the world. As the Son is obedient to the Father in the Spirit, even unto the cross, so too are we, baptized Christians, obedient to the Son in the Spirit, even unto the cross. As the Father loves the Son in the Spirit, so too does the Son love us in the Spirit. As the Spirit is that which makes the Father, the father of the Son, and the Son, the son of the Father (as the “relational person” in the Trinity), so too does the Spirit make the Son the Lord of humanity and make you a disciple of the Son. Furthermore, the Scriptures and the Tradition of the church do not just tell us that God is making us disciples of the Son in a relationship that is one-to-one, it also tells us that God’s plan for the salvation of the world is accomplished through making humanity one with each other and by making humanity witnesses to and the object of a church bound by the Spirit with Christ at its head. As Father and Son are made one by the Spirit and the individual is made disciple of the Son in the Spirit, the church is made one with each other in the Spirit. As the Father begets and sends the Son in the Spirit, so too do we make and send disciples in the Spirit into the world. As the Son is obedient to the Father in the Spirit, even unto the cross, so too is are those in the church subject to one another in the Spirit, even unto the cross. As the Father loves the Son in the Spirit, so too does the church love each other in the name of the Son in the Spirit. As the Spirit is that which makes the Father the father of the of the Son, and the Son the son of the Father, so too does the Spirit make the church brothers and sisters in Christ. The “inner-life” of God is revealed and is truly present in the church with Christ at its head. 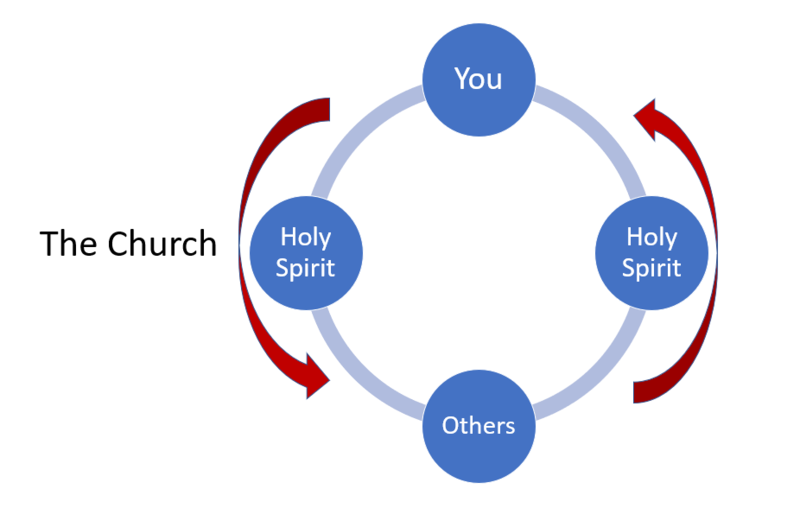 The models I have proposed, “The Immanent Trinity”, “Discipleship”, and “The Church” follow the same pattern and subsequently do not exist independent of each other. 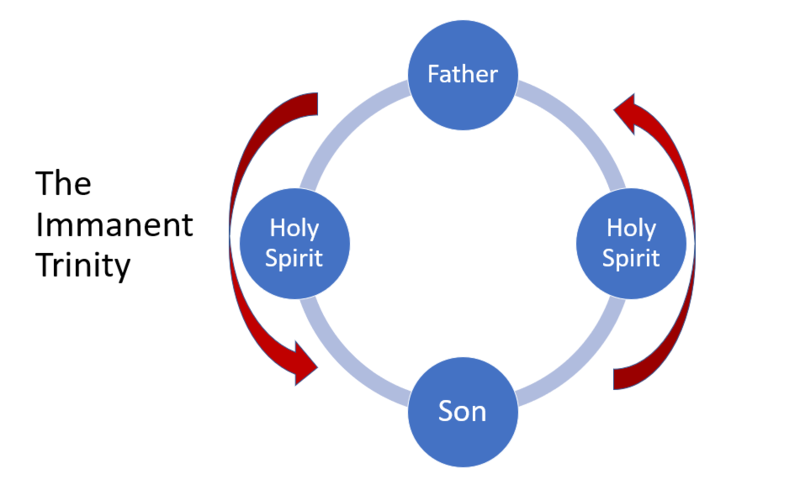 They are necessarily connected as flowing from the relationship of Father to Son in the Spirit and Son to Father in the Spirit as revealed through Scripture and Tradition. They tell a story of what God has done, and how the disciple of Jesus Christ, and the church to which the disciple belongs, are part of God’s larger story of salvation history. These models when combined together are “The Economic Trinity”. They describe what God has done and point towards what and how God has revealed. Most pastors and theologians can define an endless number of terms for you about the Trinity. They can give you history, philosophy, and scriptural references about how all this is held together. But my experience has shown me that most pastors and theologians cannot explain why it matters. They can’t tell you what difference it makes. They cannot tell the church who lives its faith in the created world why its Traditional Model has any bearing on their life. A Trinitarian theology that can’t tell you this isn’t Christian theology. It isn’t good news. God is so desperate for us to know what God is like, that God becomes human so that we can see and touch and know God for ourselves. A Trinitarian theology that is indecipherable to nearly everyone and breeds non-engagement isn’t Christian theology. It isn’t good news. Trinitarian theology is the story of what God is doing for us. It’s a story of creation and liberation. It’s a story of salvation and love. It’s a story of mourning and loss, death and resurrection. And this story plays out in your church, in your family, in your community, and inside you. It’s happened. It is happening. It will happen tomorrow. This is God. Anything else is a theology of less than, and that, in my opinion, is heresy. Fellow prisoners, the cupbearer and baker of Pharaoh, imprisoned for offending the king, turn to Joseph to interpret their dreams, desperately looking for hope and answers while languishing in prison. Joseph does so, and his interpretations prove true. Just as Joseph foretells, the cupbearer is shown mercy by Pharaoh and is restored to his life, while the baker is hanged. The cupbearer, now freed, does not speak for Joseph, but forgets him in prison. We ask, where is God’s steadfast love? Years later, Pharaoh dreams and is afraid. None of the wise men or magicians in Egypt can interpret his dreams. The cupbearer, still serving Pharaoh, remembers Joseph, and tells Pharaoh of a young man in prison who successfully interpreted his own dreams years ago. Pharaoh summons Joseph up from the prison, and the boy who was once sold into slavery by his brothers for interpreting dreams, now hears the dreams of Pharaoh of Egypt who demands an adequate answer. “I was standing on the banks of the Nile; and seven cows, fat and sleek, came up out of the Nile and fed in the reed grass. Then seven other cows came up after them, poor, very ugly, and thin. Never had I seen such ugly ones in all the land of Egypt. The thin and ugly cows ate up the first seven cows, but when they had eaten them no one would have known they had done so, for they were still as ugly as before. Then I awoke. Pharaoh is pleased, and chooses Joseph, the man imprisoned, to be the wise man set over all of Egypt. He is second only to Pharaoh in authority and in power. Joseph set to his task of collecting and storing up during the time of plenty in preparation for the famine. Each year, he takes up one fifth of all the produce in Egypt, and when the famine arrives with all its power seven years later, all the world comes to Joseph bowing before him to buy grain – including ten brothers from the land of Canaan, sons of a man named Jacob. When biblical interpreters read the story of Joseph, his brothers, and the famine in Egypt, they are mostly caught up in the relationship between Joseph and his family. This is, in part, due to the amount of attention that the text gives to Joseph and his brothers encompassing most of chapters 42 through 45. But, it’s also due to interpreters’ lack of imagination and curiosity about the story as a political and economic text. The events that drive this story forward are the great famine that befalls Egypt and Joseph’s plan, approved by Pharaoh, to manage the famine through taxation and political authority, the relationship of Joseph and his brothers is what happens on the side. How Joseph deals with the famine, and its effects on Egypt and the nations that surround it, has been largely ignored, especially by Christianity’s most influential interpreters and theologians, the pastors who preach and teach the scriptures. We have done so to our own detriment. When we hear Joseph’s interpretations of Pharaoh’s dreams, we recognize, like Pharaoh does, that his plan is wise and right, for we know just how much the land will produce and when it will stop. Joseph’s plan to save in times of plenty by taxing the people and storing excess grain for the famine is wise and good. He combines the ability to discern the future through dreams and the foresight to minimize the cost of the famine through present action with the power from Pharaoh to carry out his plan. As a result, the people live. Notice what has happened here: the writer of Genesis has declared that it is wise for the rulers of the people to enforce saving and restrict consumption during good economic times, and that it is wise for the rulers of the people to mandate spending and boost consumption during bad times. What Pharaoh recognizes as wise and what Jacob interprets from Pharaoh’s dreams as a gift from God is exactly what modern economists describe as an ideal fiscal policy in the modern economy. Market economies have historically gone through cycles of growth and recession. Long periods of growth tend to be followed by periods of slow, stagnant, or even negative growth. The causes of these cycles are hotly debated as is the best course of action for how to respond or prevent high volatility and downturns, but over the 20th century, a general consensus developed among economists for how governments should ideally spend during these cycles as part of the normal spending process and in response to stagnant or negative growth. Their general outline is fairly simple and promises less volatility, less painful downturns, and higher long term growth. Politicians have never followed it. Save during booms. Spend during recessions. Higher taxes during booms. Lower taxes during recessions. Higher interest rates during booms. Lower interest rates during recessions. Do that, and the economy and everyone in it, will be better off. Of course, that’s not so easy. It isn’t easy to figure out if you’re in the beginning, middle, or end of growth or recession or when state action will start to affect the economy. It isn’t clear what combination of spending, tax rates, or interest rates a country should have or how to implement them in a timely and effective fashion. Furthermore, such action may not address underlying problems that triggered a downturn and spending, and, taxes and interest rates are prioritized by things other than just macroeconomic fiscal policy. Still, the general consensus holds true even among economists who would otherwise disagree. If you’re going to spend at levels above current revenue, it’s better to do so during times of recession than times of high growth. But, that doesn’t happen. We spend all the time. When we stray from the general consensus and have deficit spending during periods of growth, two things naturally occur: 1) the boom is accelerated increasing volatility and ultimately causing a bigger fall when the market turns and 2) deficit spending limits the ability of the state to counteract a recession through deficit spending in the future by decreasing the effectiveness of future spending and reducing the availability of funds at a given price – future spending will be more expensive to finance. A third outcome is also inevitable, deficit spending on both ends of the business cycle results in a higher national debt, that may or may not be manageable given its size, the particular nation’s overall prospects, and interest rates. This result may ultimately lead to fiscal crisis. One ironclad rule of economics and psychology is “People respond to incentives”. This is always true. Those in office are almost always incentivized to spend now rather than saving for later. This holds whether or not the country is growing or in a recession. A president or legislature ruling during a business cycle of growth and recession will likely face an election before the particular cycle is finished. And given that voters vote according to how they are currently doing rather than a more complex understanding of overall economic health or strategy, they will reward faster present growth rather than predictions of future growth or stability. They will reward leaders who spend to boost the economy now, even if current deficit spending is unwise, and the leaders will likely be out of office once the boom turns to bust. At that time, the leaders will be rewarded for spending to stimulate the economy out of recession once again. The only way out of this is a disciplined, informed electorate who punishes politicians who are self-servingly fiscally irresponsible. We can only do this by valuing future growth more than we value present growth, and by valuing expert opinion more than we trust those who directly benefit from a change in spending like politicians or the direct beneficiaries of such spending like connected businesses. However, there is a danger present in following Joseph’s advice. It’s a danger that Pharaoh misses and that present experts often ignore. It’s a danger that the writer in Genesis sees clearly but sadly is not often told by pastors and preachers. Many of us intentionally or not, preach on the scriptures in the Revised Common Lectionary, which is a selection of scriptures that follows the liturgical year over three year cycle. It attempts to go through as many books and biblical themes while equipping the pastor and the church to faithfully teach and learn from the Bible. Unfortunately, by organizing it this way, the church overemphasizes the texts that are listed and sometimes completely misses texts that are not. The lectionary follows the chapters and verses in Genesis that focus on the relationship of Joseph to his brothers. It does not include what happened to Egypt as a result. An odd section of Genesis appears abruptly in the middle of chapter 47 that interrupts the story of the Joseph and his family. It describes the famine in Egypt from which Joseph’s plan was meant to limit harm. Famine had reached the whole of the land, and the people cried out for bread just as Joseph foretold. Joseph had taxed the people during the times of plenty and had stored up their excess grain to relieve them during the famine. When the people cry out for land, what does Joseph do? The people ate the food. Joseph kept the money. When the food was consumed, the famine continued, and the people were still hungry, they cried out to Joseph for bread again. Joseph responded in verse 16, “Give me your livestock, and I will give you food in exchange for your livestock, if your money is gone.” And they did. Joseph took all the livestock of Egypt and Canaan and added it to Pharaoh’s house. The people ate, and they lived. Joseph bought all the land of Egypt, and took all the people as slaves for Pharaoh. Joseph enslaved the entire nation for the price of the food, which he took from them as taxes years before. They gave their food because of his power. They gave their money because they trusted him. They gave their livestock because they were starving. They gave their land and their bodies because they had nothing left. Joseph, the boy sold into slavery by his brothers, enslaved all the world through the power of God’s gift of interpreting dreams and through the foresight of a favorable fiscal policy. He took something great, the ability to limit mass suffering, and with it, forced the whole world to his knees in submission. The danger in all of this is that the power we grant to our leaders to spend in times of want and save in times of plenty – this power we grant them will be closely guarded by those who hold it and closely sought after by those to come. They will use it to buy our support and to manipulate our feelings. But like the people of Egypt, it was their food in the storehouses, not Joseph’s and not Pharaoh’s. The power to spend is our power. It is our money. It is our land. It is our bodies. We must hold it more tightly than the leaders to whom we entrust with this power. If Joseph, son of Jacob, the one favored by God, can use such power to enslave all the world, what will our leaders do? The deficit under President Trump grew to $666 billion in his first year, up nearly $80 billion from the year before. The deficit proposed under the President’s budget could reach $1 trillion by the next year and is set to grow further. Taxes have decreased. Interest rates have been raised, currently the only “lever” of the economy following the general consensus under the leadership of Janet Yellen in the Federal Reserve. She was dismissed by the President against precedent after serving a single term and replaced by a member of the President’s party. Today is Giving Tuesday, a day in which many non-profits and charitable organizations will make appeals for donations to worthwhile causes. I hope you give, and continue to give generously. Unfortunately, the manner in which many such organizations solicit funding from donors is deeply problematic. One of the most popular ways to compete for donation dollars is to claim that the organization spends little money on overhead and that a high percentage or your money goes directly to programming. From my own tradition, UMCOR, the United Methodist Committee on Relief, says that 100% of what you give goes to programming. That sounds wonderful. Who could object to more money going to people in need rather than administrative costs? The accounting practices used to claim that money is going to “programming” rather than “overhead” borders somewhere between unethical and outright fraud. You would be shocked to find out what counts as “programming” in the non-profit world. They feel justified in doing so because it has become standard practice in the industry to invent and follow a new budgetary language foreign to any business school. There are almost no non-profits that advertise based on “programming vs overhead” that are being honest with you. They do this, not just to trick you, but primarily because you, the donor, demand it. We want to be tricked. We want our money to go to the cause, not fill bank accounts of non-profit CEO’s. This notion is foolish. Organizations are successful because the people running the programs are successful, not because X% of dollars goes to programming. The people running the programs can be successful when their headquarters are competent, and well managed. They remain so if they are properly supported, properly equipped for the job, and properly paid. The jobs they do are complicated and require extensive education and training. The places where they work are often difficult, dangerous, and far from home. They have to monitor where money goes in areas where they may not speak the language or may not be able to perfectly navigate cultural differences. They also have to do this in places where the rule of law and beliefs about corruption don’t work the same as in the West, and even at home the job is difficult and expensive. How do non-profits reconcile the problem of the need for high-end staff and the need to send X% of money to programming as required by donors? First, they short their staff, and rely on staff’s feelings of commitment to the cause so that they can pay them salaries and benefits below the market rate and far below what they deserve. The result is high turnover, high stress, high levels of dissatisfaction, high level of cynicism, and overworking them until they burn out. Second, they lie to you, or rather they knowingly define “programming” different than everyone else in the world, hide such definitions in the unwritten assumptions of the budget, and know that you will never look at it. The result is predictable. When staff aren’t properly paid or properly equipped to do their jobs, the work suffers. Beneficiaries who need the assistance given to them by non-profit organizations receive worse services. Non-profit workers can often move into other industries, but people who rely on their assistance usually have few other options. The core problem here is unrealistic expectations of donors. You want your cause of choice solved for cheap. You want to outsource solving near impossible problems to “do-gooders” but don’t want to give “too much” money. You want staff to be experts but want to pay them like amateurs. Most of all, you don’t want to do the hard work of going through a budget, understanding complex issues, questioning your assumptions, or evaluating projects and staff, so you take a shortcut of “programming vs overhead”. Non-profit workers are professionals, not volunteers. If you want professional work, you have to compensate them like professionals and pay for a professional work environment. If an organization promotes their giving based on “programming vs overhead”, run away. Or, ask to see their budget and ask questions about what counts as programming. Better yet, have a meal with one of their workers doing the actual work of interacting with beneficiaries and figure out for yourself if they and their projects are worth supporting. Then write a check earmarked to “overhead”, “employee salaries”, “office equipment”, or “parental leave” and walk away knowing that you might actually have done some good. When the Israelites conquer Canaan as described in the book of Joshua, this scene repeats itself over and over again. Israel engages its enemies. God intervenes. The enemy is given into the hands of Israel, and, by the edge of the sword, the entire population of the city is killed. Men, women, children. There are no survivors. There are dozens of verses describing dozens of different military encounters that result in the total destruction of armies and civilian populations in an effort to eradicate the people living in Canaan. It’s impossible to read this as anything other than genocide. I didn’t learn about this in Sunday School when I sang about the “Walls of Jericho” as a child. Like my peers, I was unfamiliar with and unprepared for arguments against Christianity regarding biblical violence when I first encountered them as a young adult. The church has failed its youth in preparing them for an adult faith by attempting to protect them from the harsh realities of scripture. These texts need to be seriously engaged in every youth program and from every pulpit, or else youth will enter an unforgiving, cynical world unprepared and disillusioned resulting in either fundamentalism or non-engagement. Either the church will teach these texts, or someone else will do it for us. Protection by avoidance has been a disaster. Instead of addressing difficult questions, the church would rather preemptively defend itself. The battle of Jericho is made into a cute story for children. The text describing the murder of infants has been forgotten. There is no need to defend against charges of divinely ordained genocide when children sing cute songs. There is no need to defend against biblical violence when we have learned, since childhood, to ignore the unpleasant realities of our faith. The response by the church to violence in Charlottesville has been disheartening. The church should never equivocate over the “rightness” or “wrongness” of opposing sides, especially when one side includes Nazis and the KKK and when that side initiates violence that results in the death of the innocent. Christian moral teaching does not claim that “all sides are to blame” for moral error as if guilt can somehow be reduced if the other side is not perfect. Christian witness does not back away from assigning fault or choosing sides, but it reminds us that we are not blameless before God, so we should be honest in our accusations and gracious in our judgment. We do not seek vengeance or retribution. We seek forgiveness, reconciliation, and justice. Unfortunately, the self-serving confirmation bias displayed by the church has been shocking. We have been eager to support people whose views match our own and eager to demonize people whose views do not. The information bubbles in the ideological divides of the church has left each group largely unaware of what and how others think, leaving us eager to decide for ourselves what our opponents views are. This should terrify a global church whose members will never and have never agreed with each other with regard to faith and politics. If someone opposes us, we gleefully label them the “racist alt-right” or the “extremist, socialist left” as if the myriad of people who reacted to the events in Charlottesville can be easily classified into a limited number of groups that the rest of us immediately understand in full. The church should reject and fear such fallacious, reactionary thinking. Our forebearers have made this mistake before and the result was “destruction by the edge of the sword all in the city” and have called such violence “faithfulness”. Many churches and Christian leaders have rallied to claim that those who marched in Charlottesville to advocate for racial violence do not represent the nature of the church. By immediately claiming the moral high ground and affirming what Christianity “really is”, of course in opposition to the racist nationalists calling for violence, the Christians advocating “true Christianity” have obscured, rather than revealed, the nature and mission of the church. The church, even the “true church”, is not a body without error or sin. There is not some quasi-Platonic “true church” out in the heavens free from the stain of violence and sin. The only “true church” is the one that we have. It is not innocent. Both our sacred texts and history show the church as both victim and culprit of racist, nationalist, and tribal violence. The Book of Joshua is a prime example. In it, Israel destroys multiple cities and murders all of its inhabitants to take possession of land that God has promised them. This is done at the command of God, and it’s God, not the people of Israel, who is responsible for military victory. Most Christians do not want to think about or seriously engage a text that describes God as ordering the deaths of thousands of children at the edge of the sword. God is the actor in the genocide of Canaan. Israel is just faithful in carrying out God’s slaughter. Is this the God of the modern egalitarian church who preaches tolerance and love? Or is the Nazi’s God of violence and racial purity? Without attempting to answer, the church has little meaningful response to those who preach racism and violence while claiming to defend a western Judeo-Christian culture. The church has an opportunity to seriously engage with violence, racism, and tribalism using our own history and theology. We should be well-equipped for this task, but so far, the best we can muster is a faint, generalized criticism of our tribal opponents and praise for the myth of the “true church”. We could proclaim loudly that those who call for or commit racist, tribal violence are not beyond redemption. The church of Jesus Christ holds the book of Joshua as holy scripture and is comprised entirely of sinners. We could hold up on our violent past. We could confess our sin. We could ask for forgiveness for not living up to our ideals and work together to change. We could confess that the racist, tribal legacy of the church through the stories of Israel conquering Canaan in the book of Joshua has no archaeological or historical support, but was instead developed centuries later to support a centralized monarchy in the attempt to justify violence. We could claim that the various texts who describe this event in the books of the Bible contradict each other, and that the best historical evidence available to us does not show the rise of Israel as outsiders conquering the land of Canaan through violence as described in Joshua, but shows a social revolution in Canaan in response to local needs and from the threat of outside violence from powerful empires. We could confess that our ancestors “changed history” and codified this myth into scripture. They created this myth of a more violent past to justify desired further violence against its enemies. Enemies who are defined by their ethnic, cultural, and political identities. We could admit that Christian history, like the rest of human history, is one in which racism, tribalism, nationalism, and violence are the norms, not outliers. Our tradition, our saints, nor our scripture are free from this. Neither can we hold up Jesus as a modern egalitarian who unequivocally loved and accepted everyone. The god who became human, actually was an ancient human whose ministry cannot honestly be ripped from its context of religious renewal and opposition to outsiders into our own context of western liberalism, equality, and universal values. To the Syrophoenician woman (Mark 7: 24-30) who was asking Jesus to cast a demon out of her daughter, Jesus said in reply, “Let the children be fed first, for it is not fair to take the children’s food and throw it to the dogs” – meaning, she was a dog and she wasn’t worthy of Jesus’s blessing due entirely to her heritage. No amount of excuses or historical revisionism can remove Jesus from his own context of being a 1st century Galilean in a culture that was historically abused and oppressed by outsiders. Instead, we could admit that the story of God’s history of salvation is one in which God is continually revealed through human action which necessarily involves human mistakes, misunderstandings, and sin, including the evils or racism and bigotry. We could teach our children that we don’t have it all figured out. That we don’t know the answers. That our heroes, our ancestors, and our saints believed and did things that we find morally outrageous because the church, like our democracy, is always striving for a more perfect union and that the God who acts in history to reconcile and forgive us isn’t finished yet. We could admit that we will not see its conclusion and that our own children will remember us for our many mistakes and errors. We could admit that we don’t have to be embarrassed of our humanity because our God isn’t, but we do have to correct and learn from our mistakes. By not doing these things, the church robs the Gospel of its transformative power. As we are, God dies for us. God’s plan for the redemption of the world is the church – not the “true church” – but the real one that has let you down. The one we love to hate. The one from which I still run. The church cannot be relevant, transformative, or faithful without also being honest. And the response by the church to Charlottesville has not been. In this response, the church has been co-opted by outside interests who have always been happy to use, and then later disavow, the church according to its own needs. While calling out racism, tribalism, and violence as a moral evil is necessary for the mission of the church, doing so without extending grace and forgiveness and without examining one’s own self is antithetical to our calling. There’s no middle ground when it comes to grace. To love the church and to love the world that God has created, is to love it in its brokenness and to extend to it grace and forgiveness without condition. To choose to love its myths over its reality or to choose to love it for what it could be instead of what it is, is to engage in an act foreign to the Gospel and foreign to the mission of Jesus Christ. Advice to pastors, church members, and Christian parents: stop spreading the myth of the true church. Instead of telling everyone how the true church really isn’t racist or tribal but conveniently conforms to everything we already think, tell them the stories in our scriptures that show what we really are. Tell them about Jesus and the Syrophoenician woman. Tell them about the Joshua and its depicted tribalism and genocide. Tell them about how Jonah was upset that God was gracious instead of killing all the Assyrians. Explore our history of racism and violence and struggle with it together. And tell them about how the church, as we are, is redeemed but not yet made perfect. As a first-year student at Wesley Theological Seminary, I decided to start a fantasy football league with the goals of encouraging friendships and encouraging blasphemy. It was a huge success. Friendships were created, football was watched, beer was consumed, and unforgivable sins were sinned. It’s been going strong for 9 years. Fantasy football revolves around two things only: 1) Creating offensive/funny team names, and 2) Feeling superior to your friends for little to no reason. Like My Weems? No. I Lovett. For those of you who don’t know, your standard fantasy football league consists of 10-12 teams and each team can select from all active NFL players. A standard team has a starting lineup of 1 quarterback, 2 running backs, 3 wide receivers, 1 tight end, 1 kicker, and 1 defense. All you do is select your players, and after each week’s game, you add up each player’s stats. The higher the stats, the higher the score. This isn’t football. It’s a math game that counts pro football stats alongside really bad puns. Oddly enough, players who score the most fantasy points aren’t always the highest valued or best players in fantasy football. Because a fantasy team has to use 1 quarterback, 2 running backs, 3 wide receivers, and so on, maximizing total points for your team isn’t about getting players who score the most points, it’s about acquiring players who score more points relative to other players at their position. As a result, while quarterbacks score more points than anyone else, running backs who score half as many points or less are often much more valuable. To explain, imagine if quarterback (QB) Tom Brady scored 50 points a game by throwing a lot of touchdowns. Running back (RB) David Johnson scored 20 points a game by running for a lot of touchdowns. Tom Brady scores more points, but if the average quarterback in the NFL scored 45 points a game, Tom Brady would only be worth 5 points more than the average QB. 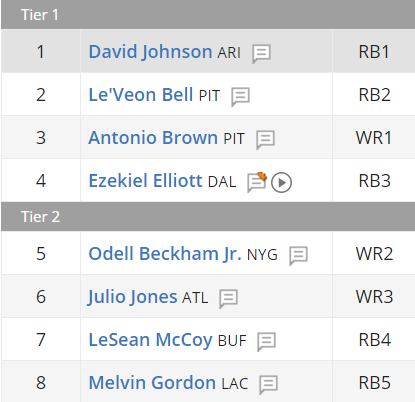 If the average running back only scored 5 points a game, David Johnson would score 15 more points than the average RB. A team of average QB + David Johnson would score more than Tom Brady + average running back. As a result, David Johnson is worth more even though he scores fewer points than Tom Brady. The lesson: A fantasy player’s relative value is the fantasy player’s actual value. The top rated quarterback and arguably the best player in the NFL, Aaron Rodgers, doesn’t show up until number 31 (as of posting). The reason is because there are 32 teams in the NFL, which means that 32 quarterbacks will play each week. If your fantasy team only starts 1 quarterback and there are 12 fantasy teams in your league, there are a lot of other options. But if your fantasy team starts 2 running backs and each NFL team only starts 1, there are few fantasy substitutes. Due to the scarcity of good players within the running back position, running backs are more valuable relative to other positions. Wide receivers (WR) are in a similar position. I love fantasy football for more than just the funny team names and watching my favorite players. I love it because I get to see how economic theories and models play out in non-traditional settings. The mistakes people make, the values placed on players, and how that differs from regular NFL football, can all be accurately predicted. And yet, these basic economic lessons learned in fantasy football are rarely applied to other parts of life, even by people who play obsessively. In truth, immigration policy isn’t all that different from your standard fantasy football draft evaluation, if only those who play fantasy football would apply the same lessons. There are two standard arguments for limiting or decreasing immigration into the United States. 1) Immigrant workers compete with native workers thus increasing native unemployment, and 2) Immigrant workers compete with native workers thus driving down the wages or benefits received by natives. The standard arguments have a lot going for them. They’re simple, easy to understand, and are rooted in basic common sense. If a buyer has two sellers who offer the same product (in this case a job), the buyer can offer less money and play the sellers off each other driving the price down. An employer is in a strong bargaining position if there are many different applicants and can ask to pay a lower wage. This is a rare case of something being both naturally intuitive and also taught by basic economic theory. But the standard arguments quickly fall apart in reality. Not only is increasing immigration positively correlated with low unemployment, but increased wages are also positively correlated with high levels of immigration as well – immigration, employment, and increased wages all increase at the same time. This shouldn’t be surprising. When there are more available jobs, and employers are paying more money to employees, more foreign workers will try to get them alongside native workers. Also, the standard argument depends on the assumption that amount of jobs is static as if the number of available jobs is fixed within the economy. However, there is no fixed number of jobs. Jobs are a dynamic market response to demand, and when people immigrate, they also need housing, groceries, and computer repair which stimulates even more demand. Economic dynamism through other factors like worker productivity, technological growth, and consumer confidence are difficult to measure, but are far more important factors for employment than simply counting the total number of immigrants. Still, even after claims like “immigration decreases wages” or “immigration increases unemployment” are debunked both in theory and according to available evidence, people are still hesitant to support more immigration. Another more refined argument is often presented and is often championed by politicians who oppose each other ideologically. This refined argument has been long supported by people like Donald Trump and Bernie Sanders. The refined argument is a lot like the standard one, but instead of stating that immigration increases unemployment or that it decreases wages, it claims that immigration increases unemployment and that immigration decreases wages for the working class. Opposition to immigration is often sold in this manner as being humanitarian and rooted in a concern for the poor rather than just being anti-immigration. A corollary argument is that we don’t want to stop immigration, we just need the right kind of immigration. The right kind of immigration is of course, immigration that doesn’t compete with the working class (or whatever class or industry from which you want to win votes). As a result, many people support immigration for high-skilled workers but not low-skilled ones. This conveniently fits into nationalist or even outright bigoted views which only want immigration from countries like Canada, the UK, France, or those that share our values – read: rich, white, Christian countries. No one cares if software engineers move to the US from Canada, but those construction workers from Mexico? They’re ruining the economy! The refined argument, along with nationalist ones, supported by populists like Bernie Sanders and Donald Trump, are certainly appealing, but as appealing as they are, they run into the same problems that the standard argument does. The numbers just don’t support their claims, and their argument runs counter to basic economic theory. Remember why running backs are more valuable than quarterbacks in fantasy football? They’re not more valuable because they’re better players, or even because they score more points. In most cases the running backs that you choose over Aaron Rodgers and Tom Brady score fewer points and are in fact, much worse football players in real life. They’re more valuable in fantasy football because they score more points relative to other players at their position. Remember, their relative value is their actual value. You win by acquiring players who score more points relative to other players at their position, not by getting players who score the most total points. When a “low-skilled immigrant worker from Mexico” enters the workforce in the United States and begins to compete against native workers for jobs, the low skilled worker affects the job market by “taking a job”, but more importantly, by changing the relative value of all workers who are currently competing. “The low-skilled immigrant worker from Mexico” may be intelligent and hard-working, but compared to the average US worker, the Mexican worker is almost always at a serious disadvantage. English is unlikely to be the worker’s native language. Education quality or level completed is likely to be less than the average US worker. Knowledge of work culture, expectations, and customs is likely to be far lower. Legal status and protection may place the worker at a disadvantageous position creating risk for both worker and employer. Long-term commitment to the job is likely far lower than the native worker as the Mexican worker may choose to leave, or through the laws of the United States, could be forced thus increasing the expectation of staff turnover and costs. Such examples could continue indefinitely. Simply put, on average, low-skilled foreign workers are generally less desirable to employ than native low-skilled workers by employers. If you don’t believe me, go to any union hall in America and ask. As a result, the native low-skilled workers relative value does not decrease with higher levels of immigration. It increases. By a lot. If you were an employer and you were trying to hire workers for your company and John was an average worker, you would pay him an average salary compared to everyone else with similar skills and experience. But if the job still needed to be done and the quality of worker suddenly declined and your available adequate workers were terribly in short supply, John is a much more attractive option to hire or to retain as an employee. Suddenly, even without gaining skills or working harder, he’s more valuable and his market value has increased. This is the fantasy football equivalent of other available running backs getting injured – suddenly your average running back looks pretty good! John can get paid more because the quality of the competition has declined. This is exactly the same thing that happens when lower-skilled foreign workers enter the United States. Increased immigration from poor countries increases the relative value of American workers thus increasing their actual value. The standard argument could only plausibly make sense if foreign workers were perfect substitutes for American workers, but available evidence (and racist nationalists) tell us exactly the opposite. The majority of foreign workers in the United States are not perfect substitutes. They are imperfect substitutes, just as a no-name running back in fantasy football is an imperfect substitute to your average starter who broke his leg. The presence of imperfect substitutes doesn’t just increase the value of the “original”, the imperfect substitute is one of the main reasons why the “original” was highly paid in the first place – the other options aren’t as good. If substitutes weren’t imperfect, but were instead perfect, the price would always be low because workers could be switched around at will. Increasing the amount of imperfect substitutes into a labor market raises the relative value of the “original”. The only group for whom immigrant workers may be perfect substitutes are high school dropouts and the last generation of immigrant workers. Those who argue only for high-skill labor are actually working against the well-being of the working class. By making working class Americans compete in the job market against only high skilled laborers, their relative value declines and they will get paid less or will be pushed to unemployment. Many people will take offense at the suggestion that some workers are “lower-skilled” or that others are “imperfect substitutes”. Such complaints aren’t based in reality and only function to protect their own entrenched beliefs. Ironically enough, such people almost always support candidates who want to restrict immigration “for the sake of the working class” resulting in permanent low wages for immigrants in their native countries and stagnant wages domestically. They’re neither humanitarians nor doing anyone any service. Don’t be like them. People actually do have skills that we can quantify and the introduction of such skills into an economy is almost always good – even better if those skills are markedly different than what is currently available. Different skills benefit an economy even if those skills are “lower”. American working class wages have declined or stayed stagnant over the last few decades mostly because technology has become perfect substitutes for a number of different tasks once done exclusively by laborers and workers have had difficulty increasing their skills relative to the incredible pace of the competing technology. In fact, machines have become so productive that they’re often superior options instead of substitutes. As the number of Americans working in manufacturing has declined and the amount of money spent on capital improvements has increased, productivity has greatly increased. We produce more in the US than we ever have in history. There are only a few options in front of us if we want to increase the working class relative value again. 1) Increase their skills through education, 2) Smash the machines, or 3) Introduce imperfect substitutes to the American worker through increased immigration. I choose options 1 and 3. Bernie Sanders and Donald Trump have chosen options 2, in effect trying to turn back time, and they try the opposite of option 3 by limiting immigration. In fact, our politicians have chosen that exact same set of policies for decades. Preventing technological innovation and restricting immigration has long been the policy choice of both Republicans and Democrats. To learn more about immigrant labor as imperfect subistutes to native labor resulting in increased wages and employment, please read the following study by Gianmarco I.P. Ottaviano and Giovanni Peri entitled, “Rethinking The Effects Of Immigration On Wages”. Or you can just play fantasy football. Start thinking of funny team names now. In taking the general equilibrium approach instead, one realizes that the substitutability between U.S.- and foreign-born workers with similar schooling and experience, as well as the investment response to changes in the supply of skills are important parameters in evaluating the short and long run effects of immigration on wages. We therefore carefully tackle the tasks of estimating the elasticity of substitution between U.S.- and foreign-born workers within education-experience and gender cells and we account for physical capital adjustment in the short and long run. We find robust evidence that U.S.- and foreign-born workers are not perfect substitutes within an education-experience-gender group. This fact, and the yearly adjustment of capital to immigration, imply that average wages of natives benefit from immigration, even in the short run. These average gains are, in the short and long run, distributed as a small wage loss to the group of high school dropouts and wage gains for all the other groups of U.S. natives. The group suffering the biggest loss in wages is the contingent of previous immigrants, who compete with new immigrants for similar jobs and occupations.